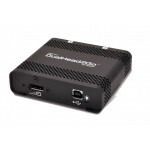 Matrox TripleHead2Go DisplayPort Edition T2G-DP-MIF External GXM from Matrox is an external Graphics eXpansion Module that lets you drive 3 displays, each at up to 1920 x 1080 resolution, from a single DisplayPort (DP) connector. This allows you to drive 3 displays from a laptop or from a desktop that only has one DisplayPort. You can also drive the 3 displays at 1680 x 1050 resolution each, or you can drive just 2 at 1920 x 1200 resolution each. The module allows you to drive displays using DVI, VGA, HDMI and Mini-DP outputs, provided you have the required adapter cables (not included). 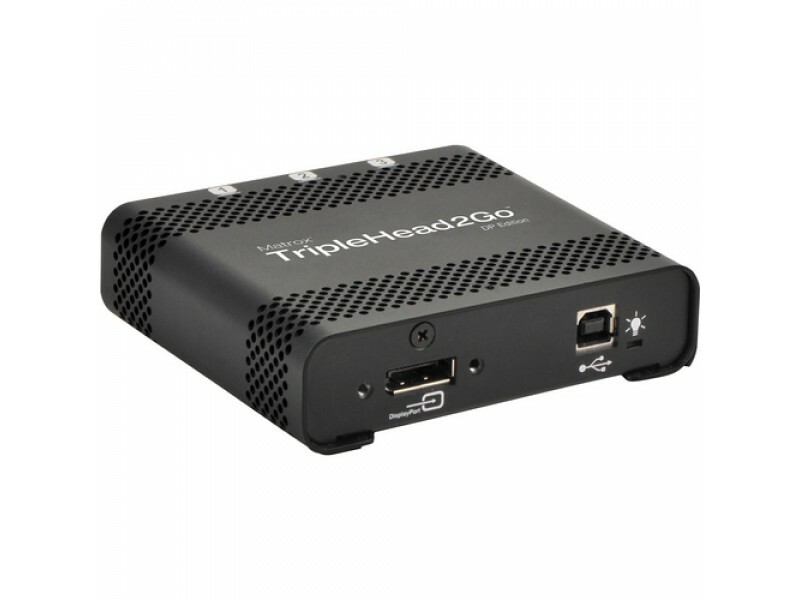 You can even connect a second TripleHead2Go to your graphics hardware to support up to 6 monitors at a time! 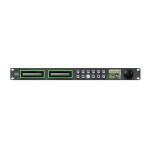 The module uses your system's existing GPU to provide high-quality, uncompressed graphics and video across all monitors. You can run different applications on each display or view one application across multiple monitors. A multi monitor set-up allows you to organize your workspace more efficiently, multi-task more comfortably and make fewer mistakes. Compatible with both Mac and PC, a wide variety of graphics cards, and most chipsets by ATI, Intel and nVIDIA, the TripleHead2Go DP Edition is a great way to quickly and easily add triple monitor capability to a notebook or desktop PC. Increased Productivity A triple monitor configuration can help enhance productivity when working. You'll find it much easier to work with multiple documents and windows at the same time, allowing you to more effectively multitask. Surround Gaming Using 3 displays for computer gaming can create a more immersive experience. A "surround vision" can create a panoramic effect that makes computer game playing more like a widescreen movie. This increased field of view lets you see more of the game environment. Many popular games support this configuration. Bundled Management Software Includes Matrox PowerDesk software to easily manage your desktop configuration. Includes Matrox Monitor Bezel Management (Windows only), designed to enhance gaming environments by converting 3 seemingly disjointed images into 1 continuous image, enhancing the surround gaming experience. Matrox Clone Mode is available for viewing a copy of one display on the other displays. 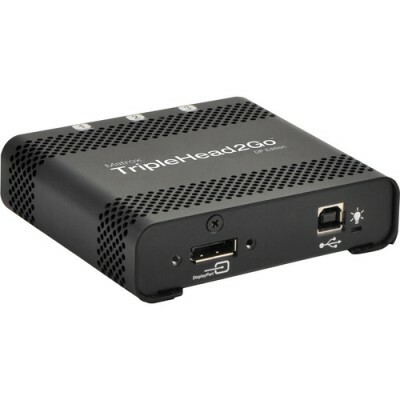 The TripleHead2Go can be used with a notebook or desktop computer with a DisplayPort. You'll be able to add 3 independent displays to your laptop or desktop from its monitor output. Your computer screen can be displayed on three 1920 x 1080 monitors via DP output for an impressive 5760 x 1080 resolution. Or, you can display your screen on just two 1920 x 1200 monitors via DP, for a total resolution of 3840 x 1200. For a complete list of supported resolutions, see DP supported resolutions. For supported resolutions using DP to DVI or VGA connections (adapter cables required), see DVI supported resolutions or VGA supported resolutions. You can drive HDMI and MDP monitors, as well (cables required), at a maximum resolution of 5040 x 1050 (3x 1680 x 1050). You can fit the TripleHead2Go in the palm of your hand. This allows you to take it where your notebook goes, giving you the ability to take advantage of triple-monitor displays wherever you have access to them. Painless Installation Quick and easy to install; there's no need to open the computer case or insert components. Easy Access Spans taskbar across monitors for easy access to all your open applications. Wide Compatibility The device works with LCDs, CRTs and projectors. 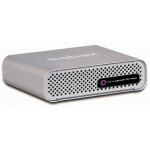 It's compatible with both PC and Mac computers, as well as a wide range of notebook and desktop video cards. It supports most graphics chipsets by ATI, Intel and nVIDIA.